The race starts Sunday at 0700 at Matapeake State Park on the Chesapeake Bay. SPOT updates will post here. Since I don't have the tracking subscription, lots of OK messages will show up here. These will turn into GPS breadcrumbs on the Watertribe challenge mapper (see sticky above) and the SPOT shared page. My unfortunately named crew is HingleMcCringleBerry (aka Matt Kelly). Wish him luck in his first Watertribe adventure! We're prepped and ready for the race - see you at the start! Daniel and I took The Rise out on Saturday in 15-20kt winds. We launched from Gravelly Point and sailed across the river towards Fort McNair. With such favorable winds we hit 8.5 kts with the sail reefed to about 50%. We sailed up into the Washington Channel past all the SW Waterfront marinas and restaurants and across from East Potomac Park. In the channel, winds got much slower and we floated downwind all the way to the end and tacked back out. We got one long tack back up to the Gravelly Point channel and started to try to beat our way back to the boat ramp. In this wind we just couldn't make progress in the tight channel (and didn't want to get in the way of the powerboat traffic) so we dropped the mast and paddled in. I'm still making use of the sweet sailing hat my sister made me! Jack and I came up with a list of the things we learned on this trip. I'll post them here in case someone else can benefit from our experience (and also so we don't have to relearn them ourselves). This first category is centered on 'Course Decision Making.' We probably made a number of tactical errors on course which could have improved our finishing time or improved our comfort level for the whole race. This is our list so far; feel free to comment on them! Need to work out minimum upwind tacking speed versus paddling direct to your destination. This is a must have for any Watertribe type race, where you will often face adverse winds and currents. Assuming 45 degree tacks with the wind coming from your destination (like we faced all day Friday), less than 70% of your actual speed is directed towards your goal. If you can paddle faster than you can sail, drop the mast already! You do have to make the trade decision between paddling effort expended and race progress. For a longer race, it would probably be worth it to sail slowly in order to conserve your energy for when you really need it. For a 'short' race like the NCC, even an hour difference in a long leg could make the difference when it comes to tides and wind shifts. Reef early, rather than during the storm. This is obvious, but when the winds aloft are strong and a front can move in at 35mph, you need to be ready early! Another reefing lesson: hiking out is fun and lets you go a little faster, but consider how you will feel 12 hours later when you are still wet, the sun has gone down, etc. In very strong winds you might even be able to sail faster with the sail reefed depending on the limitations of your leeboard / centerboard sizing. For a two-person team, sailing reefed also enables one of the crew to sleep instead of hiking out. Don't change out of wet clothes unless you are sure it will be dry for a while (or it is an emergency). Schedule 'meals' to make sure you will have enough calories to stay warm and happy. If you wait until you are hungry, you might be trying to dig through a hatch in the middle of a storm. Study tide data ahead of the race, and print it out or write it in sharpie on your charts. Your memory will be affected by sleep deprivation and stress. With the one above: make sure to schedule rest breaks and naptime to coincide with adverse tidal conditions, wind shifts, etc. You will kick yourself later if you stop to take a nice hour long break and then have to fight for the next four hours. More to come: General preparations and Boat modifications. We arrived at checkpoint one (Taylor Creek Marina in Beaufort) with our spirits lifted by the favorable wind shift that carried us across the Newport River. We sailed into the checkpoint just as Jarhead and Michigama were heading out. After jockeying for position to give them a clear path to depart, we finally made it to shore. Scareman supplied us with directions to the bathrooms and a hot cup of Ramen noodles. The hot Ramen really hit the spot. We sorted through the rest of our (already wet) clothes, picking out the best combination of layers that would still keep us warm despite the damp. We logged in our notes so far and recorded a quick video for Scareman. Both were probably pretty incoherent. Now we had nothing left to do but sail on. We left the CP about an hour after arriving. Jack sailed us out the creek while I dozed off for about a half hour until the next navigational decision needed to be made. After consulting my phone, we decided to take the shortcut route north of Harker's Island. The winds were still blowing from the NW which put us on a nice reach all the way to the Harker's Island bridge. We hailed the bridge and asked them to open up for us. After confirming we were too tall to clear the closed bridge, we got the OK. We kept sailing straight towards the bridge, waiting for the gates to come down on the causeway and the bridge to start swinging. The operator's timing was perfect; we sailed through on the left side as the bridge swung away from us. We cleared the bridge without problem and continued sailing east towards Core Sound. As we cleared the bridge about 8AM we saw a catamaran ahead of us. It was Teak and Kokopedal. We caught up to them on our reach since we had not yet reefed our sails. We sailed abreast of them out in to the sound, until we paused to reef in the sail to about 50% of full working area. Our goal after the wet ride on Friday was to stay dry in the boat (no hiking out) even if it limited our speed. About this time I got a text message from Dan, who was watching the SPOT feed: "Go go you almost caught Teak!" It was neat to know that people were watching the race from home. Core Sound was rough. The winds put us on what would be a long beam reach but the waves were choppy and confused (not coming from the direction of the wind). Every time a bigger wave would hit the boat (every 15s or so) we would lose momentum and slow down before speeding back up again. Nevertheless we made OK progress up the sound. We had been warned about nets and there were shoals marked on the map, so we were cautious about getting too far out of the channel. We briefly tried to tack upwind but found it impossible to make progress against the combined wind and waves, so we maintained course. As we were settling in for the long haul we suddenly saw the mast of the Teak E Torch go down. From our perspective, it looked like they had capsized, but as we got closer we saw them derigging the mast. It turned out they had lost a shroud line. Good thing they had a great pedal drive system to give them enough power to get back into shore and repair. Once we knew they would be OK we sailed on. After a while the waves died down a little and we were able to fully deploy the sail. We started making much better speed. The only thing that gave us trouble was trying to estimate our progress towards the next turn without sitting and staring at the GPS (we still needed to save battery). You could sum this up with the phrase 'objects in distance are further than they appear'. Fortunately this gave us a long time to update our route plan based on the wind conditions. Good sailing - before the clouds! We decided to take another shortcut through Cedar Bay and out through the slew. We had heard at the captains meeting that this gap was passable but at low tides might require you to jump out and push the boat along. We turned up into Cedar Bay and started tacking towards the exit, passing Jarhead and Michigama who were making impressive progress sailing and paddling upwind. Here we encountered the strangest wind conditions of the course. The wind seemed strong, but a steady stream of low puffy cumulus clouds were passing overhead from the NW. Every time a cloud passed overhead, the wind would stop entirely or change apparent direction. The air was likely getting sucked up into the clouds (cumulus clouds are formed by thermals) meaning the air was moving vertically instead of horizontally. Either way, it made sailing a pain since we would hit a lull every thirty seconds or so. When we had wind, we would make good speed and I would hike out if possible, but I ended up having to come back in every time we hit a lull. After a great deal of cursing and 'paddle sailing' we finally got set up for one final tack out the slew. It was shallow for the last half mile or so towards the exit. We raised the leeboard and rudder halfway. Eventually we could see the waves breaking at the inlet but couldn't tell how deep it would be. We aimed for a PVC pipe marker and hoped for the best. In the end, we sailed right through without problems. Conditions on the outside were about the same except we now had big rolling waves (but no breakers). The gusty wind conditions continued on the ocean side, and we had to try a few different tacks until we finally just paddled hard all the way to the beach. We dragged the boat up out of the water and collapsed onto the sand. We made it in 1 day, 8 hours, and 50 minutes. Jarhead and Michigama spotted ahead! Also, wind-stealing clouds. Somewhere along Core Sound at about 10:30 AM, our SPOT stopped tracking. The OK messages we sent at the last two turns never went through. Whether it was operator error, bad line of sight (clouds?) or something else, we don't know. Fortunately we made it to the beach and didn't need to use the SPOT's SOS feature. Last update I got as far as the entrance to Clubfoot Creek. We arrived at about 8PM and changed into our nice dry clothes while sailing into the mouth of the creek. We hadn't seen any sign of other Watertribers for hours. Night had just fallen and we rigged our boat with red and green glowsticks for navigation lights and found our flashlights and headlamps. The wind by this time had shifted to come exactly from the south, so we were only able to sail a couple short tacks into the creek before we needed to furl the sail and take down the mast. We dropped the mast without incident and secured it to the outrigger crossbeams. The first few miles into the creek were uneventful. We finally saw our first Watertribers, KnightSailor1 and KnightSailor2, heading the wrong way back up the creek towards the Neuse! We figured the tree had blocked them and they were turning around to head for the ICW. We hailed them for info but got a cryptic answer. They sounded tired. It was dark. We continued paddling on. At about 3 miles in, the sky started to darken with clouds. A giant wall of thunderclouds moved east across the creek at what we considered to be unreasonable speed. Lightning that had been on the horizon was booming right off the shoreline. We battened down the hatches and adjusted our spray suits and waited for the oncoming wall of rain. It moved over us and almost instantly soaked through all our gear. Cold and wet (what's new...), we kept paddling on. All of a sudden we saw a bolt of lightning strike at what seemed like just a few hundred yards from the far shoreline. We were in the middle of the storm now. We decided we needed to get off the water. Hugging the treeline didn't seem like a smart idea since it could be just as bad as being on the water. We decided to pull off at a house that had a visibly lit carport with some folks standing outside. We beached the boat, walked up, and introduced ourselves, not sure what to expect. The Storm! JohnnyFive posted this radar image on Watertribe. In the end, we met a couple friendly guys who offered us towels, steak, beer, and a truck to carry our boat around the bridge. We refused all except the cold beer. In retrospect water would have been a better choice! At any rate, we hung out under the carport for about twenty minutes to let the worst of the storm pass before heading back out to the wet boat and returning to the creek. After one beer our motivation was flagging. Our arm muscles felt like they had atrophied. The current had turned against us during our weather hold. We made it to the canal and shortly after, the first bridge. The giant tree we expected to see blocking our path had been neatly severed. We paddled through without incident. When we reached the second bridge, we pulled to the side and hooked the front crossbeam on a bridge piling, anchoring us in the current for a 30 minute nap. I was about ready to drift off when I was jolted awake by an incoming text message. I woke up Jack and we both looked up and saw boat lights heading towards us - another watertriber? It made a U-turn and disappeared down the canal. We never saw it again. After being jolted awake we decided to continue paddling on. The current sapped our energy but we managed to make slow progress. We prayed we would reach the fabled 'tidal node' and get a free ride out. After a while, we got our wish, about the time we reached the marshes on the south end of the canal. The wind started to pick up as the canal opened into the marsh. We raised the sail and drifted out, stopping a couple times to un-run-aground ourselves. A couple floating markers and PVC pipes marked the channel into the Newport River. As we rounded the first corner we found our first favorable winds of the night, from the NW. We sailed east on a broad reach around the big marshy spots before jibing south to head into the Beaufort channel. Jack got some good sleep while I manned the boat from the front seat. We made it across the river and to the bridge in about an hour. We hailed the bridge but they closed at 10PM (we arrived at about 4:45). We dropped the mast (not even bothering to furl it), sailed through, raised the mast again, and sailed into CP1 about 5AM. Returning to land was a huge morale boost - I'll post the rest of the story soon. Jack and Katherine met me down in Cedar Island, NC. We launched the boat off the trailer and they paddled it around to the starting beach while I went to the captain's meeting. Chief ran down the usual race details: SPOT tracker setup, safety brief, etc. After the meeting we rigged the boat on the beach and packed our gear into dry bags. Mostly we had to figure out how much gear we could leave behind. Katherine finger-painted the new NC hull numbers on the front of the boat while we rigged the mast, sail and boom. Also, check out the sweet pressure treated hiking benches. These were built in the lull between coats of paint as a simple solution to allow us to hike out safely in high winds. To stick with the boat's KISS philosophy they were lashed to the crossbeams (akas) with flat bike tubes, just like the outrigggers (amas). After packing most of our gear (we used our sleeping bags and pads and other important bits that night) we went to the Driftwood Motel for a tasty surf-n-turf dinner. After making last chance checks, we settled in for the night. Next morning we woke up and prepped the rest of the boat as the sun rose over the beach. 50 other sailboats, kayaks, and canoes were there on the beach, including my friend Alan (SOS) and his dad Paul, in their Core Sound 20, as well as Sam and Tim in a Hobie 18. At 7:30 the race was on. We shoved the boat off the beach and into the shallows. I jumped in the boat a little too soon and had to jump out and push again, but all in all it was a pretty uneventful start. As we rounded the breakwater at the ferry landing it became clear that we were not going to win this race. The winds were light and we lacked the sail area to really get up to speed. We watched Sam and Alan's boats (and the Hobie trimaran fleet) get smaller and smaller in front of us. The slow start gave way to more slow sailing up the Neuse. The wind was coming from the SW, exactly the direction we wanted to go. We could only make about 4 knots on tacks going on tacks a hair more than 45 degrees, so we figured we were making less than 3 knots towards our goal, so we dropped the mast and paddled straight towards it. After a good stretch of paddling (aka Character Building) the winds picked up once more. We raised the mast and got in some better tacks. Despite the windier conditions we felt like we were making little progress. For several tacks in a row we used the same aiming point (water tower, radio tower) as the wind continued to shift to always stay directly in the desired direction of travel. Despite our slow progress we were enjoying the ride and took turns hiking out on alternating tacks. Photos show our spirits were still high. We also made good use of the dorky hats Katherine created for us. Now we get to a dry spell - no pictures for about a day or so. I was actually using my iPhone as the GPS unit for the race, using the Navionics chart app to get marine charts that work with the data service off. It worked great, but I needed to save battery. That meant not taking too many photos or videos or checking football scores during the race... oh well. 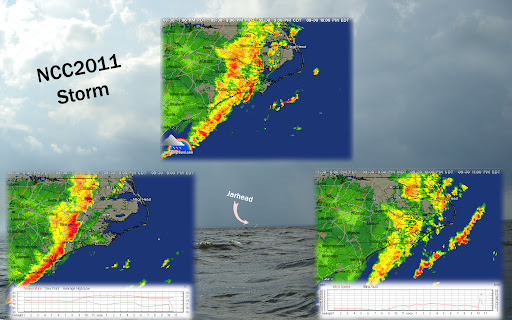 At any rate, we were still sailing in the Neuse when we got doused by a microsquall. Black clouds showed up on the far side of the river and we figured we needed to reef the sail. We took in about half the sail and were about halfway prepared to get wet when the storm came, soaked us to the bone, and moved on. After the storm, the wind died completely for about a half hour. 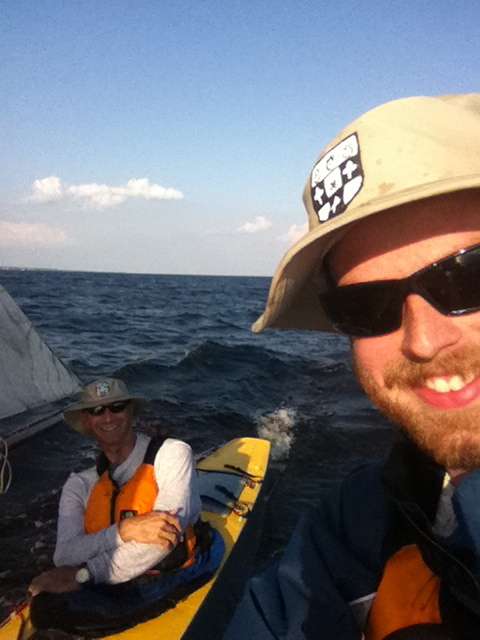 We paddled halfheartedly until the wind showed back up, this time a little weaker than before. By nightfall (almost exactly 12 hours after the start) we had just barely made it to the mouth of Clubfoot Creek (the NW corner of the NCC course). We decided to break into our MRE stash for dinner and change into warm dry clothes before what we hoped would be a dry paddle up the creek and into the Harlowe Canal. Little did we know how wrong we would be! Part two will be posted tomorrow (still need to catch up on sleep! ).